Submitted photo The Wright State University Raiders women’s soccer team earned a 1-0 victory in a hard fought road match against Oakland, Sept. 14 in Rochester, Mich.
AUBURN HILLS, Mich. — The Wright State University women’s soccer team headed to Oakland University, Sept. 14 to open Horizon League play for the 2018 season. The Raiders earned a 1-0 victory in a hard fought match, and started conference play exactly the way they wanted to. Both the Raiders and Golden Grizzlies are teams that focus on defense first, and this showed throughout the first half, as well as the match itself. Both teams registered two shots on goal in the first half. Maddie Jewell turned aside both Golden Grizzlies first-half shots, one of which came on a spectacular jumping effort. The teams entered the locker room in a scoreless draw. Oakland took control of the ball early in the second half, and did not seem to want to relinquish control for much of the period. The Golden Grizzlies took over the shot chart, but Jewell continued to keep them off the scoreboard. The Raiders did not register their first shot of the second half until the 74th minute mark, but Aaliyah Patten made the shot count after making a great move to dance around Oakland keeper Jaimie Leas, she tucked the ball into the gaping net to put the Raiders on top 1-0. The scramble was on for Oakland from that point on, as they mounted an offensive toward the Wright State net. In the 90th minute of the match, it appeared that the Golden Grizzlies had dramatically tied the match on a headed ball in the box, but the goal was disallowed on an offsides call, and the final seconds ran off the clock to give the Raiders the 1-0 victory. The Raiders (2-5-1, 1-0-0 Horizon League), now on an two-game win streak, will return to action at 7 p.m. Saturday, Sept. 22 when they continue Horizon League play against visiting Green Bay. 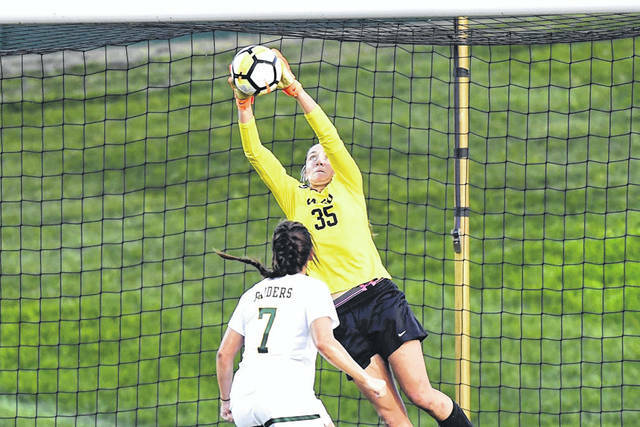 https://www.beavercreeknewscurrent.com/wp-content/uploads/sites/49/2018/09/web1_WSUsoccer.jpgSubmitted photo The Wright State University Raiders women’s soccer team earned a 1-0 victory in a hard fought road match against Oakland, Sept. 14 in Rochester, Mich.